Thanks for stopping by! This site collects news and information about the research, teaching and academic networking activities in which I am currently engaged as a member of the Philosophy Department in the Institute for the Study of Culture (IKV) at the University of Southern Denmark (SDU) at Odense. I hope that you find these as fascinating as I do! June 28, 2013. Well, the fact that this page has not been updated since December tells you something about how busy this semester has been! If you have not been keeping an eye on what has been going on on www.soundmusicresearch.org or www.nnimipa.org, please go to those sites to see what has been happening during the last six months. December 10, 2012: Concert: Wednesday, December 12, 2012, 12 noon - 1 p.m. on the Campus Square (Campustorvet) University of Southern Denmark, Campusve j 55, 5230 Odense M. Nu er det jul with Nikolaj Nottelmann, tenor, and Cynthia M. Grund, piano. Concert poster available HERE. Concert program available HERE. The seminar in the series Topics in the Aesthetics of Music and Sound with Anne Helle Jespersen, Research Librarian in Music, Head of Music Section; Library of the University of Southern Denmark, entitled 'Rhythmical Building Blocks': Creating Creativity which was scheduled to take place on Thursday, December 13, 3:15 p.m.-5:00 p.m. in U73, University of Southern Denmark, Campusvej 55, 5230 Odense M, IS BEING RESCHEDULED AS PART OF OUR SPRING SERIES.PLEASE WATCH FOR NEW DATE DURING THE SPRING! Poster for the seminar available HERE. For fall 2012 series information and updates, please see HERE. PLEASE NOTE: OUR SEMINAR ON THURSDAY, DECEMBER 6 WITH MATTHIAS BODE HAS BEEN RESCHEDULED - WATCH FOR NEW DATE DURING THE SPRING! December 1, 2012: Our seminar last Thursday in the series Topics in the Aesthetics of Music and Sound had participants attending on Skype from Texas, Ohio, England, Greece, Norway and Aalborg along with the "studio audience" in U73 at SDU! So, why not join us this coming Thursday for Matthias Bode, Associate Professor, Dept. of Marketing & Management, U. of Southern Denmark, when he gives the presentation On the Meanings of the Sounds of Commerce, Thursday, December 6, 3:15 p.m. - 5 p.m. in U73, University of Southern Denmark, Campusvej 55, 5230 Odense M. Please remember: Audience participation via Skype is always welcome. Poster for the seminar available HERE. This is the twelfth seminar in a series of 13 seminars during the fall of 2012. The schedule for all 13 seminars during the semester may be found HERE. - forskning i �stetiske l�reprocesser gennem lyd i krop, kultur og kunst (Soundtracks - research in aesthetic learning processes involving sound in the body, culture and art) was offered in Danish by IKV-SDU on Tuesday,November 27, 2012. Information available HERE Poster available HERE. 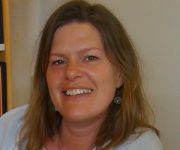 Course Directors: Herdis Toft, Assoc. Prof. in Child and Youth Culture, IK-SDU,a nd Cynthia M. Grund, Assoc. Prof. of Philosophy, IKV-SDU. Pages with course material are available HERE. Last Thursday was just great, and this coming Thursday we are looking forward to welcoming Oded Ben-Horin, Associate Professor, Stord Haugesund University College, Norway, Faculty of Learning and Cu lture (Music Dept.) - via Skype presenting Write a Science Opera on Thursday, November 29, 3:15 p.m. - 5 p.m. in U73, University of Southern Denmark, Campusvej 55, 5230 Odense M. Audience participation via Skype is also welcome. Poster for the seminar available HERE. This is the eleventh seminar in a series of 13 seminars during the fall of 2012. The schedule for all 13 seminars during the semester may be found HERE. November 19, 2012: Many thanks to participants from California, Texas, Ohio, London, York, Aalborg and Odense who made last week's seminar such a success! 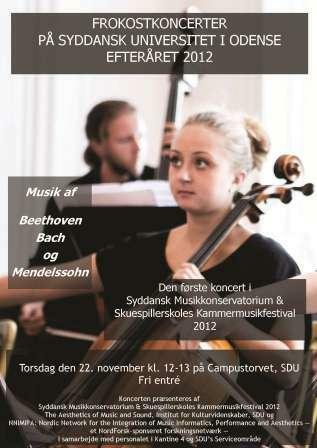 Now we look forward to a "double header" this coming Thursday: Concert: Thursday, November 22, 2012, 12 noon - 1 p.m. on the Campus Square (Campustorvet) University of Southern Denmark, Campusvej 55, 5230 Odense M. Den f�rste koncert i Syddansk Musikkonservatorium & Skuespillerskoles Kammermusikfestival 2012. Concert p oster available HERE. Concert program available HERE. Followed by a seminar in the series Topics in the Aesthetics of Music and Sound with Tom Eide Osa, Associate Professor, University of Bergen, The Grieg Academy. The seminar is entitled Wittgenstein and Music Performance as Aesthetic Practice and takes place, Thursday, November 22, 3:15 p.m.-5:00 p.m. in U73, University of Southern Denmark, Campusvej 55, 5230 Odense M. Poster for the seminar available HERE. This is the tenth seminar in a series of 13 seminars during the fall of 2012. For series information and updates, please see HERE. November 11, 2012 is the date for our upcoming seminar in Topics in the Aesthetics of Music and Sound with Tomas McAuley, PhD Candida te, Department of Music, King's College London (via Skype). Music and Epistemology: The Case of Friedrich Schlegel on Thursday, November 15, 3:15 p.m. - 5 p.m. in in U73, University of Southern Denmark, Campusvej 55, 5230 Odense M. Audience participation via Skype is also welcome. Poster for the seminar available HERE. This is the ninth seminar in a series of 13 seminars during the fall of 2012. The schedule for all 13 seminars during the semester may be found HERE. November 2, 2012: Thanks to all who contributed to the success of Thursday's Lunchtime Concert and the subsequent seminar (see below). Our next seminar i n the series Topics in the Aesthetics of Music and Sound features S. Alex Ruthmann, PhD, Assistant Professor of Music Education, Department of Music; Faculty Fellow in Residence, Commonwealth Honors Program, University of Massachusetts Lowell; President, Association for Technology in Music Instruction; Co-Editor, International Journal of Education & the Arts, who (via Skype) will present Aesthetics and Pedagogies for Making Music with New Media on Thursday, November 8, 3:15 p.m. - 5 p.m. in in U73, University of Southern Denmark, Campusvej 55, 5230 Odense M. Audience participation via Skype is also welcome. (NOTE: A. RUTHMANN RESCHEDULED - WATCH FOR NEW DATE! On November 8, Oded Ben-Horin gives us a "preview of coming attractions" for his talk on November 29.) Poster for the seminar available HERE. This is the eighth seminar in a series of 13 seminars during the fall of 2012. The schedule for all 13 seminars during the semester may be found HERE. Welcome! October 29, 2012: Please remember that it is time once again for a Lunchtime Concert on November 1 on the Campus Square (Campustorvet), University of Southern Denmark, Campusvej 55, 5230 Odense M. Josefine Opsahl, cello, and Matias Vesterg�rd Hansen, piano perform works by Cassad�, Bach and Debussy. Concert poster available HERE. Concert program available HERE. This will be our 21st concert since the series began in April 2010.
. . . and later on in the afternoon I hope to see as many as possible at the seminar, Composition as Inquiry with Matias Vesterg�rd Hansen, Thursday, November 1, 4:15 p,m, - 6 p.m. in U73, University of Southern Denmark, Campusvej 55, 5230 Odense M. Please note that the seminar is scheduled an hour later than usual in this series in order to avoid colliding with the Hans Christian Andersen Academy Annual Lecture at SDU at 3:00 P.M the same day. Audience participation via Skype is also welcome! Poster for the seminar availableHERE. This is the sixth seminar in a series of 13 seminars during the fall of 2012. The schedule for all 13 seminars during the semester may be found HERE. October 29, 2012: Back home again after a great two-week research and conference junket in the US: Work on the project "Technological and Aesthetic Investigations of the Physical Movements of Pianists" at Texas Tech - YoutTube video and Flash slideshow on http://www.soundmusicresearch.org/TRA.html - as well as a paper at the Annual Meeting of the American for Aesthetics, St. Louis, Missouri together with William Westney entitled �From Music to Sport and Back Again: A Continuum Hypothesis� Commentator: Arnold Berleant, Long Island University. See http://aesthetics-online.org/annual/2012p.pdf So lucky that no flights were disrupted by the storm! October 5, 2012: Niels Chr. 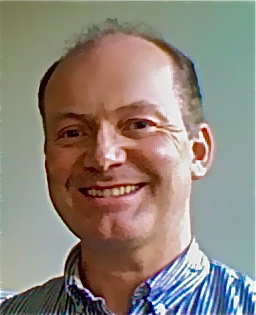 Hansen; Center of Functionally Integrative Neuroscience, Aarhus University Hospital; Centre for Digital Music, Queen Mary, University of London, United Kingdom; Royal Academy of Music Aarhus. Elucidating the Significance of Statistical Learning in Music Cognition through Behavioural Experiments and Computational Modelling on Thursday, October 11, 3:15 p.m. - 5 p.m. in in U73, University of Southern Denmark, Campusvej 55, 5230 Odense M. Audience participation via Skype is also welcome. Poster for the seminar available HERE. This is the sixth seminar in a series of 13 seminars during the fall of 2012. The schedule for all 13 seminars during the semester may be found HERE. September 29, 2012: Thursday, October 4, 2012, 12 noon - 1 p. m. in , University of Southern Denmark, Campusvej 55, 5230 Odense M. Minako Jensen, piano, performs works by Chopin, Schubert og Liszt. Concert poster available HERE. Concert program available HERE. Followed by a seminar in the series Topics in the Aesthetics of Music and Sound with Inge Bjarke entitled Improving Sight-Reading by Combining Ear, Eye and Instrument and taking place Thursday, October 4, 3:15 p.m.-5:00 p.m. in U73, University of Southern Denmark, Campusvej 55, 5230 Odense M. Poster for the seminar available HERE. This is the fifth seminar in a series of 13 seminars during the fall of 2012. The schedule for all 13 seminars during the semester HERE. September 23, 2012: Daniel John Carroll, BA, Graduate Teaching Assistant, School of Music, Bosto n University (Via Skype). Tchaikovsky's Romeo and Juliet Fantasy Overture as anExample of How Semiotics Can Inform Hermeneutics on Thursday, September 27, 3:15 p.m. - 5 p.m. in in U73, University of Southern Denmark, Campusvej 55, 5230 Odense M. Audience participation via Skype is also welcome. Poster for the seminar available HERE. This is the fourth seminar in a series of 13 seminars during the fall of 2012. The schedule for all 13 seminars during the semester may be found HERE. September 18, 2012: The research project Technological and Aesthetic Investigations of the Physical Movements of Pianists with roots in NNIMIPA brings together researchers from Texas Tech University and the University of Southern Denmark. Presentation and video published July 31, 2012 by TTU Academics and Research available HERE. September 16, 2012: Ludim R. Pedroza, PhD, Assistant Professor of Music, Texas State University School of Music (via Skype). Music as Communitas: Ecstasy and Dogma in the Performance Aesthetics of Franz Liszt and Clara Schumann on Thursday, September 20, 3:15 p.m. - 5 p.m. in in U73, University of Southern Denmark, Campusvej 55, 5230 Odense M. Audience participation via Skype is also welcome. Poster for the seminar available HERE. This is the third seminar in a series of 13 seminars during the fall of 2012. The schedule for all 13 seminars during the semester may be found HERE. September 9, 2012: Summer already seems far away now that we are just one week into the fall semester! Hope everyone has had a pleasant and rewarding time of it during July and August. To read about our summer research network acitivities within NNIMIPA - Nordic Network for the Integration of Music Informatics, Performance and Aesthetics - please see, below and www.nnimipa.org. You might have noticed a change in the "Thanks for stopping by"-paragraph: some reconfiguring of the departmental landscape at the University of Southern Denmark has resulted in the dissolution of the Institute of Philosophy, Education and the Study of Religions (IFPR) and the creation of the Insitute for the Study of Culture. This is now the Institute with which Philosophy is affiliated. This has also entailed a change in our e-mail addresses, which formerly ended with @ifpr.sdu.dk; now they end with @sdu.dk Please note that mine still starts with cmgrund, but that it now has the new ending @sdu.dk. This fall our series of seminars Topics in the Aesthetics of Music and Sound within the IKV research progam The Aesthetics of Music and Sound (www.soundmusicresearch.org) will be held Thursdays, 3:15 p.m. - 5 p.m. in U73 at SDU in Odense and participation via Skype is welcome. (For full semester schedule, please see here. We kicked the series off last week with Markus Becker, Professor in the Strategic Organization Design Uni t, Department of Marketing & Management, SDU and S�ren R. Frimodt-M�ller, Assistant Professor, Dept. of Architecture, Design and Media Technology, Aalborg University Esbjerg, presenting The Role of Routines in Music Performance and in the Accomplishment of Work in Organizations. Thanks to all who participated both in situ in Odense and on Skype and who gave the series a really good start this fall! Please not that this coming Thursday, September 13, 2012, there will be both a Lunchtime Concert and a seminar. September 8, 2012: Thursday, September 13, 2012, 12 noon - 1 p.m. in Cafeteria 4, University of Southern Denmark, Campusvej 55, 5230 Odense M. Morten Heide, piano, performs Tchaikovsky's The Seasons. Concert poster available HERE. Concert program available HERE. Followed by a seminar in the series Topics in the Aesthetic s of Music and Sound with Morten Heide entitled The Search for Musical Perfection When Preparing a Piece for Recording � Beyond the Musical Score and taking place, Thursday, September 13, 3:15 p.m.-5:00 p.m. in U73, University of Southern Denmark, Campusvej 55, 5230 Odense M. Poster for the seminar available HERE. This is the second seminar in a series of 13 seminars during the fall of 2012. The schedule for all 13 seminars during the semester HERE. Hope to see you there! if you would like to participate via Skype, please let me know in advance of the meeting, and make sure that you have the most recent version of Skype, a functioning webcam, and that you are wearing a headset to insure sound qualtiy. As always, please keep an eye on www.soundmusicresarch.org and www.nnimipa.org for updates. June 8, 2012: NNIMIPA, our NordForsk-sponsored Nordic Network for the Integration of Music Informatics, Performance and Aesthetics, joins with the RMA-MPSG (Royal Musical Association Music and Philosophy Study Group) for a four-day multi-event in London July 19-July 22, 2012 on the occasion of the second annual conference of the RMA-MPSG held at King�s College London on 20-21 July 2012. Please see HERE. . .
NNIMIPA joins with the Grieg Research School in Interdisciplinary Music Studies for the June 2012 event UNDERSTANDING MUSICALITY in Bergen, Norway June 22, 2012. Please see HEREfor information. This event is in extension of the GRS international research seminar Researching Music Practices � Methodological Approaches, June 18-21. For more information on the GRS seminar, please see HERE. . .
. . . and I would like to thank everyone who made the seminar series Topics in the Aesthetics of Music and Sound such a rewarding experience during the spring of 2012 ( please see HERE) and to thank everyone who contributed to the success of the spring 2012 Lunchtime Concert Series at SDU, please see HERE, where the program for the fall 2012 Lunchtime Concert Series will be appearing as details become available. Planning is now well underway for the fall 2012 (and spring 2013) seminar series Topics in the Aesthetics of Music and Sound. If you would like to give a presentation in person or via Skype, or if you would like to participate as an audience member in person or via Skype, please see HERE for detailed information. For archived posts from January - May 2012, please see here. For archived posts from 2011, please see here. For archived posts from 2010, please see here. September 18, 2012 The research project Technological and Aesthetic Investigations of the Physical Movements of Pianists with roots in NNIMIPA (Nordic Network for the Integration of Music Informatics, Performance and Aesthetics) brings together researchers from Texas Tech University and the University of Southern Denmark. Presentation and video published July 31, 2012 by TTU Academics and Research available HERE. Episode in the documentary television program series about the Lunchtime Concert Series at SDU, University of Southern Denmark at Odense. The nearly half-hour long (23:46) episode features concert clips from the February 10, 2011 Lunchtime Concert at SDU as well as interviews in which Gustav Krogh Hansen Piekut, Assoc. 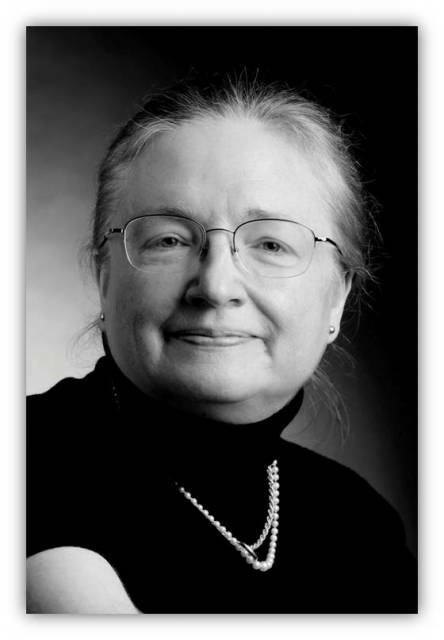 Prof. Cynthia M. Grund and S�ren R. Frimodt-M�ller, PhD participate. Aabenraa, ALT: Aabenraa Lokal TV. Grund, C.M. and Daniel Tosovic, producers� http://vimeo.com/channels/musikmedalt. � 2012 Cynthia M. Grund | site design by Cynthia M. Grund, webmaster. Site design tools and hosting provided by www.one.com.